Working at a hair salon totally has it's perks. We got shipped the new Paul Mitchell Forever Blonde line to try out before it hit the shelves. And let me tell you, we totally geeked out. Okay, maybe "geeked out" can only be used to describe me. but we were all pretty excited. It's out for everyone now, so take a look at the new line. Two shampoos, a conditioner, and a repair treatment all designed with blondes in mind. How awesome? Platinum Blonde Shampoo: Don't be alarmed. It's purple. But without going into some extensive color theory that I don't really know a whole lot about....purple neutralizes that brassy tone in your blonde. Hooray! Plus it softens strands and adds shine. So win, win. Forever Blonde Shampoo: Different from the Platinum Blonde shampoo in that it's a daily shampoo, and it's not purple. But it does keep your blonde hair light and shiny. It's packed full of protein to help combat the damage made from bleach. Forever Blonde Conditioner: An everyday conditioner that helps seal the cuticle, leaving your hair smooth and shiny. And just like its shampoo sibling, it also has lots of protein in it. 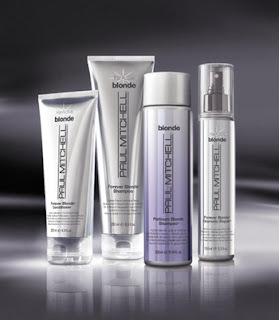 Forever Blonde Dramatic Repair: Smoothes, straightens, and replenishes depleted hair. It also has a lot of natural ingredients to help hydrate your thirsty hair. You're geeking out now, aren't you?